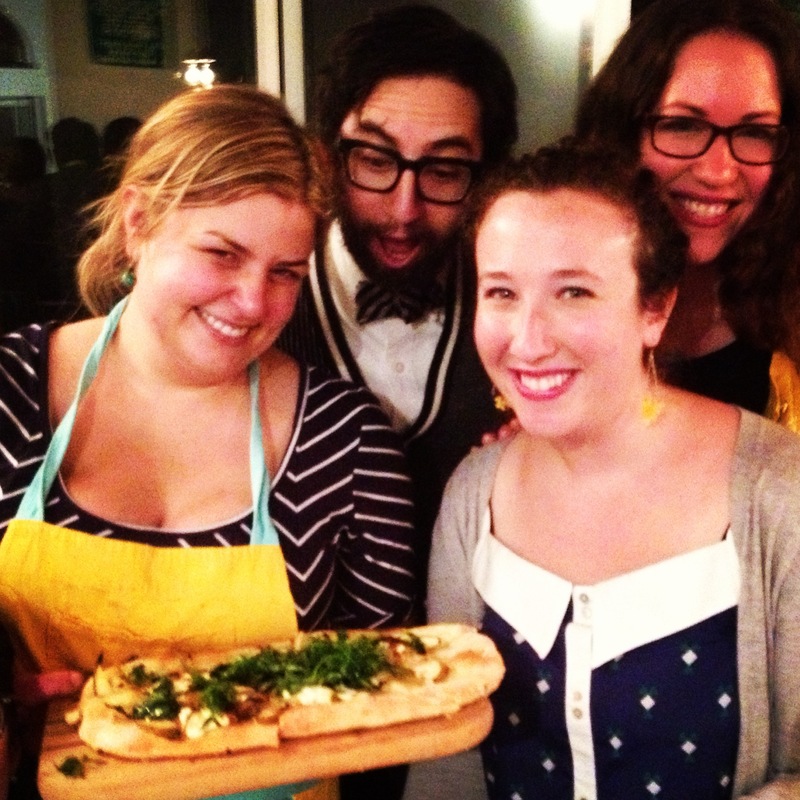 Gabi Moskowitz (aka The BrokeAss Gourmet) knows how to throw a party on the cheap. One of her secrets: Pizza dough. She made this discovery years ago, when she made a big batch to bring to a party and the host cancelled. What was she going to do with all that dough? It turns out, a lot. The next morning she twisted the dough with butter, cinnamon and sugar to make cinnamon rolls; that night she made naan to go with Indian curry. 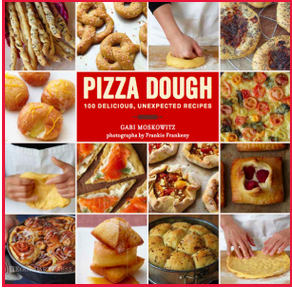 After that, she made bagels, calzones, empanadas, and more, the recipes for which, are captured in her wonderful new book, Pizza Dough: 100 Delicious, Unexpected Recipes. This was certainly true of the book launch party. Gabi arrived at my house with five pounds of dough at 5pm. By the time the guests arrived at 7pm, the table was filled with pinwheels, flatbreads, and kale salad for thirty. While the guests chatted and ate, Gabi continued to pull pizzas (and me up after I slipped on a piece of kale). The finale: freshly fried mini-doughnuts rolled in cinnamon sugar. Illustrated with gorgeous photographs by Frankie Frankeny, the book is both beautiful and practical and will be your go-to for delicious, easy, inexpensive entertaining. Gabi used homemade tomato sauce, fresh basil and Provolone to make a big batch of crowd-pleasing pinwheels. But you can use any number of toppings and sauces to suit your taste. This recipe can be easily doubled or tripled and these pizzas are portable so you can bring the party with you! 1. Preheat the oven to 375°F. Lightly flour a baking sheet and set aside. 2. On a lightly floured surface, roll the pizza dough out into a large rectangle, about 14-by-10 inches and spread the dough with the sauce. Sprinkle the cheese and scatter the toppings over the sauced, cheesed dough (remember not to go too heavy). Top with a light sprinkling of salt and pepper. Roll the dough up the long way, pinching as you go to ensure a tight seal. When you finish rolling the dough, you should have a 10-inch log. 3. Use a sharp knife to slice the log into twenty ½-inch-thick pieces. Lay each slice on the prepared baking sheet. 4. Bake until the crust is golden brown and the filling is bubbly, 18 to 22 minutes. Serve warm or at room temperature.